How do you spend a lazy afternoon? Probably lying on a couch the whole day, watching TV, gazing at surrounding over a cup of coffee, or reading a book while relaxing on a hammock. 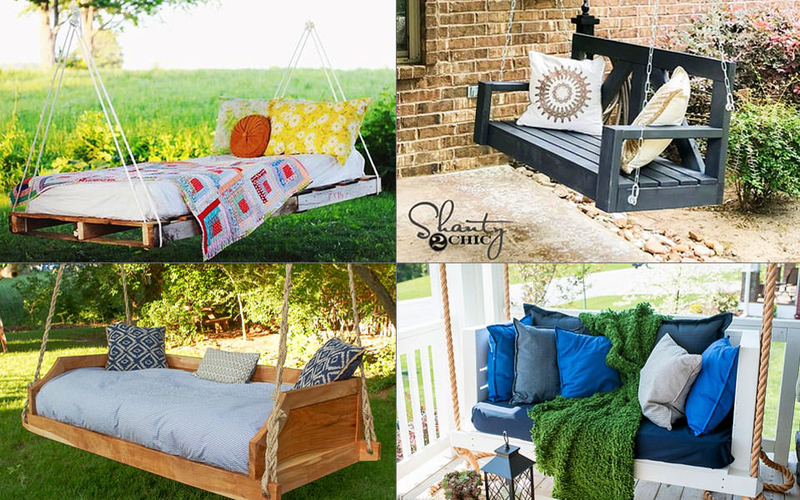 If you live in a region that’s blessed with good weather, it is a great idea to spruce up your outdoor space with a swing bed. 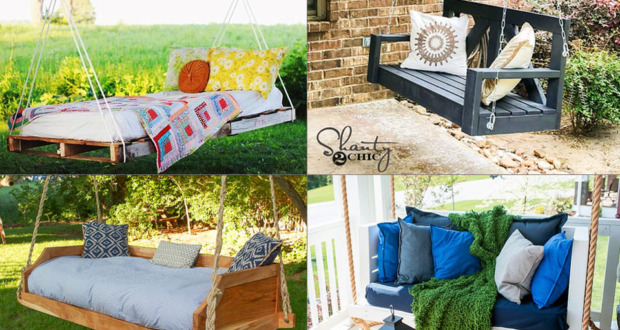 Here are a few DIY swing bed ideas that will surely inspire you by adding comfort and style to your patio or yard. 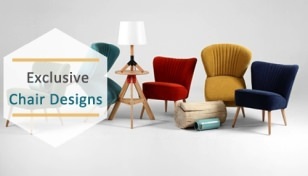 These beautiful pieces of furniture are perfect to turn your outdoor space into an oasis. 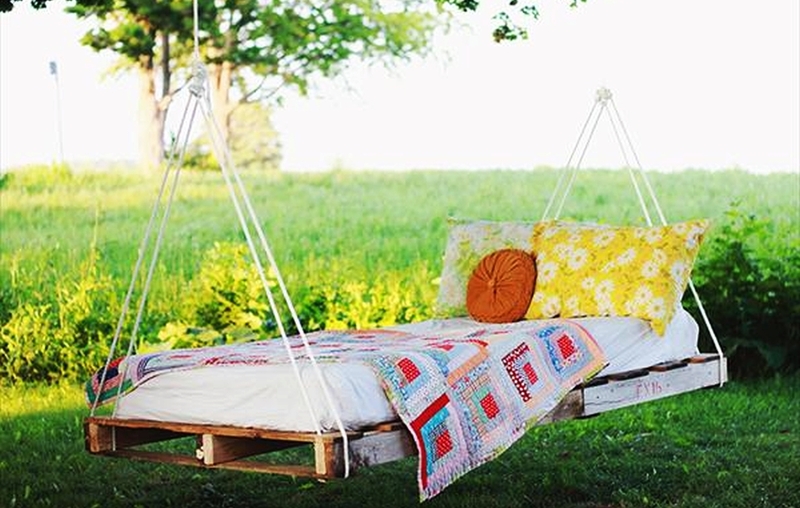 Looking like a cozy couch hanging in mid-air, this DIY porch swing bed makes a wonderful place to relax outdoors. 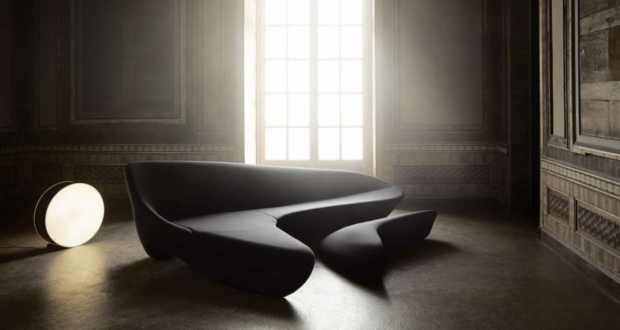 With cushions added, it ensures optimal comfort for long sittings. April Wilkerson of Wilker Do’s has made it with the help of her husband. Check out the full tutorial to see how to do with the project. 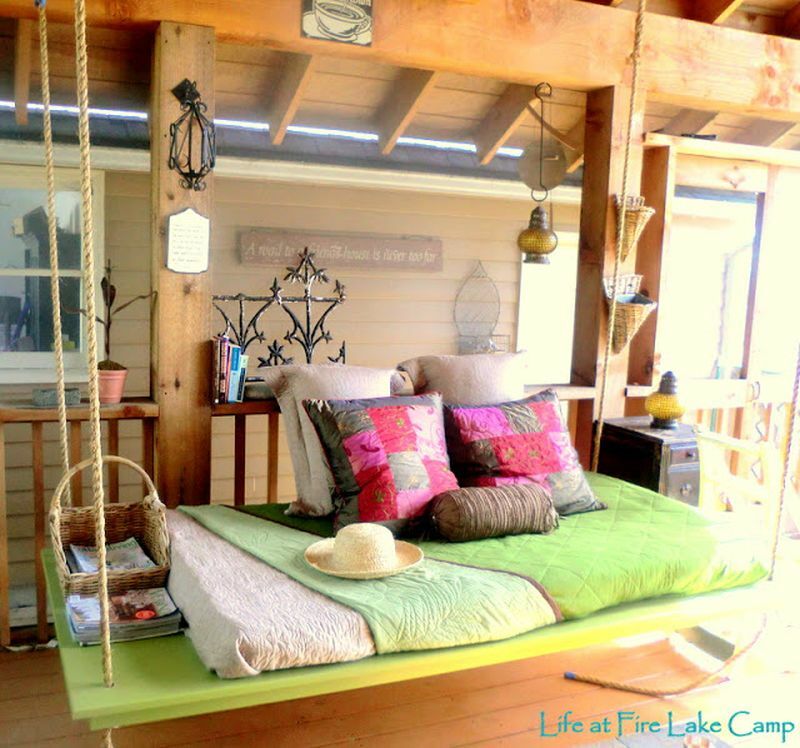 This is a simple and easy-to-make hanging daybed. All you need is some wooden boards, screws, eye bolts, rope and a few woodworking tools. 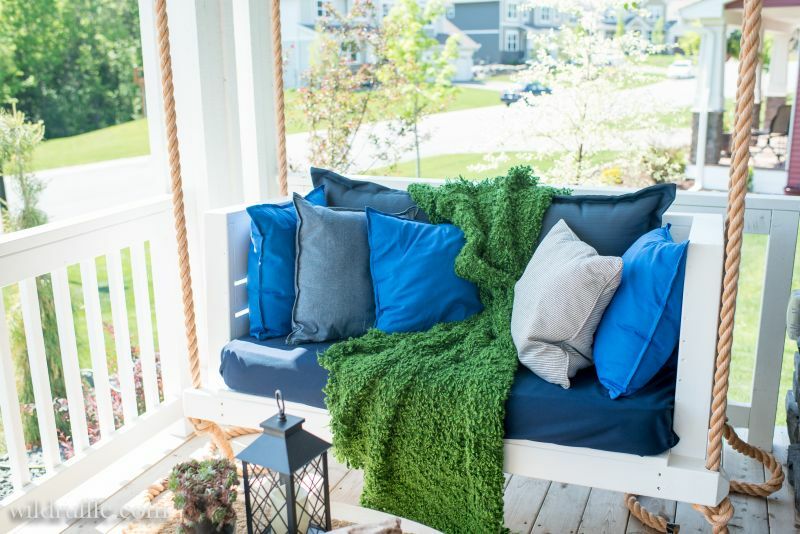 Build the frame, add a mattress, and voila – your daybed is ready to be hung in your porch. Check out the tutorial by Ana White for help. 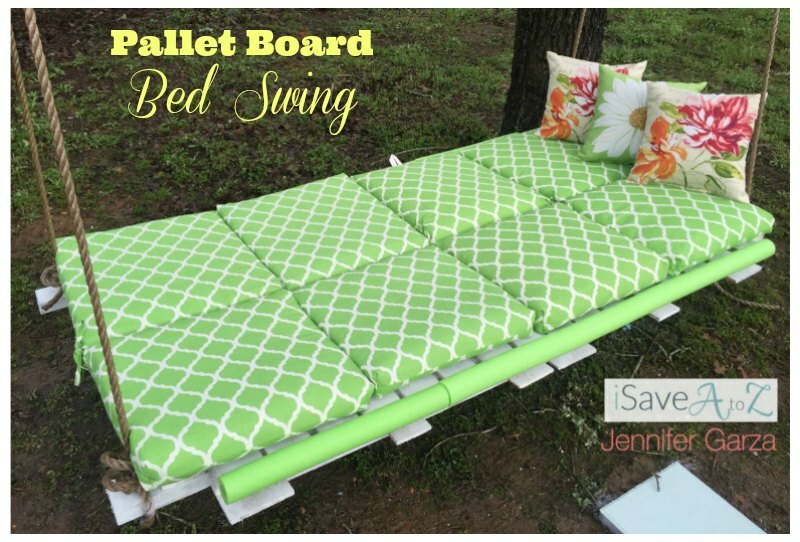 Here’s an effortless DIY swing bed made from pallets. You will have to join wood pallets into a frame, add a mattress on top and hover it from a tree branch using a rope. 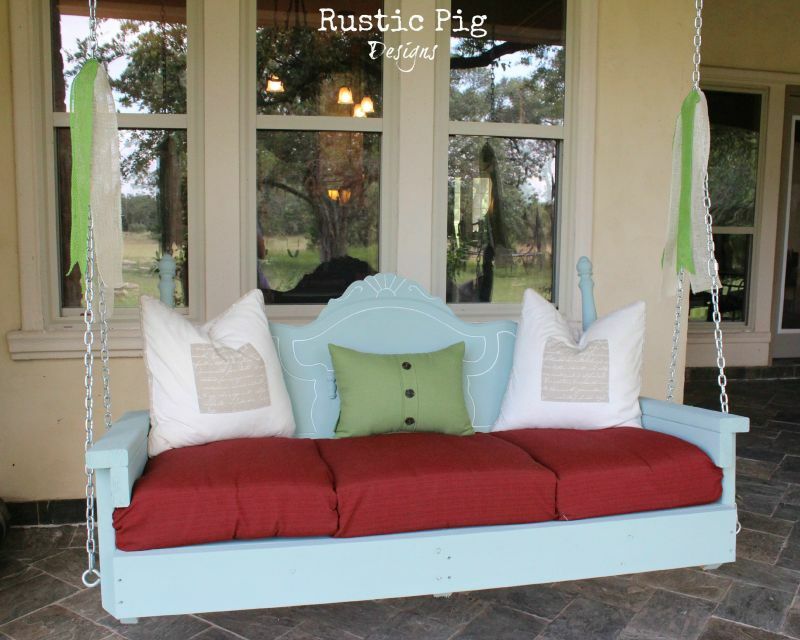 See the tutorial for this hanging daybed at The Merrythought. Have pallets lying uselessly at home, this might be the right DIY project for you. 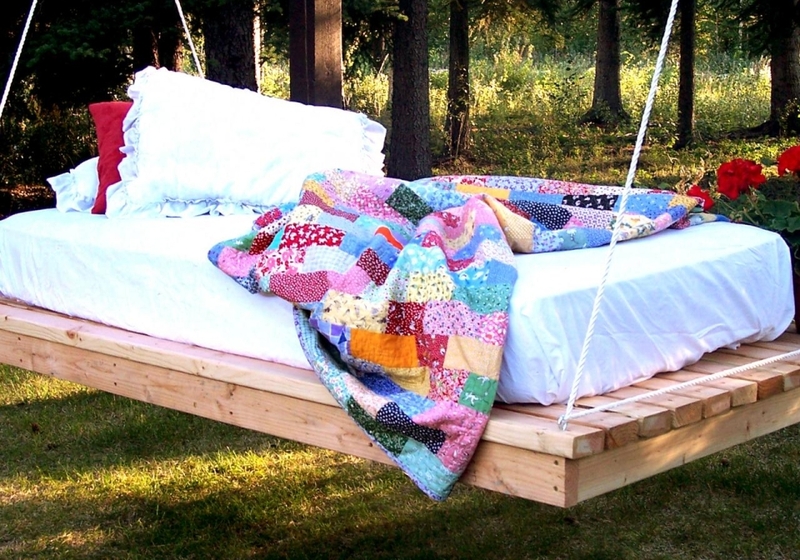 Add some cool touch to your outdoor space with this DIY bed swing made from pallet wood and Styrofoam. Green cushions add a magnificent flair, making it an aesthetically pleasing outdoor unit. 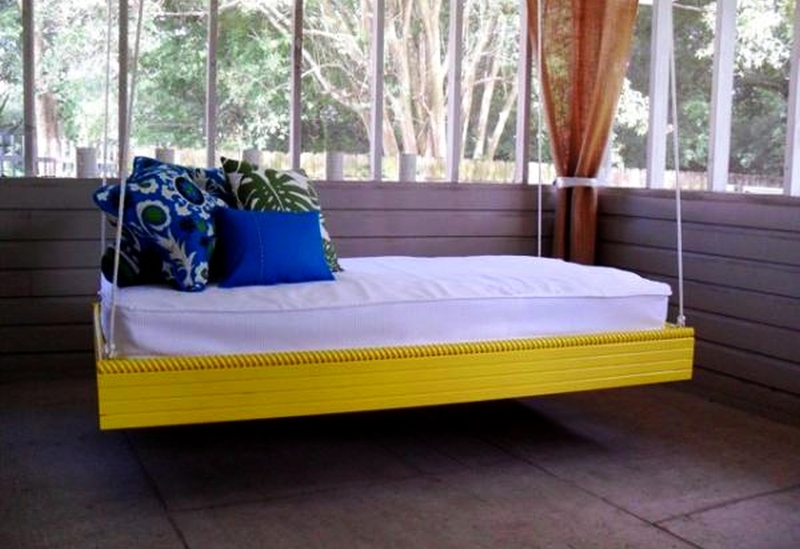 Inspired by Ana White’s hanging outdoor bed plans, this colorful outdoor furniture is really an eye-catcher. Made by one of Ana’s followers, it can inspire inspiration for others. 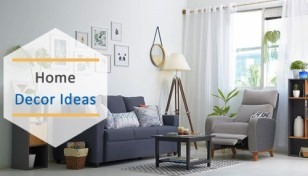 Adding cushions will enhance comfort and make a cozy spot to take an afternoon nap. 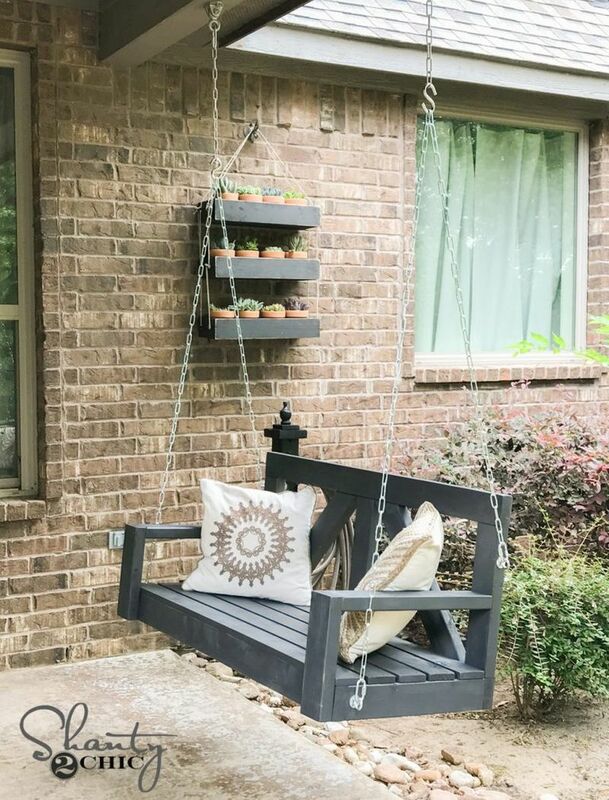 Made in a budget of $40, this porch swing finished in Rust-Oleum chalked paint in charcoal features a clean design that will surely inspire you. 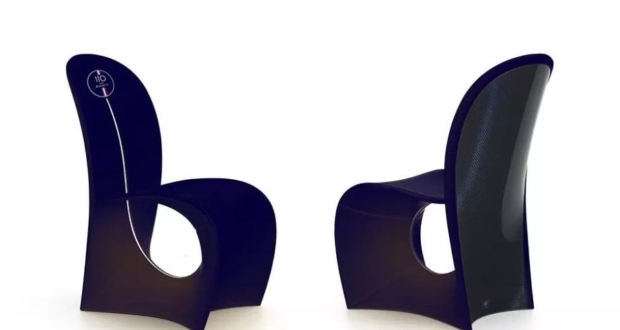 For making one, you will have to first make a frame that looks like a public bench without legs. Add some cushions and hang using metal chains. 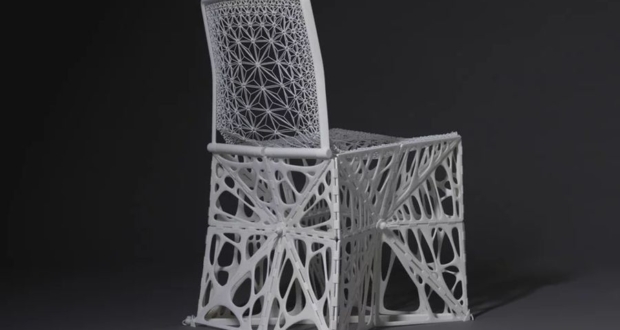 You will love to sit on it and watch birds in the blue sky. 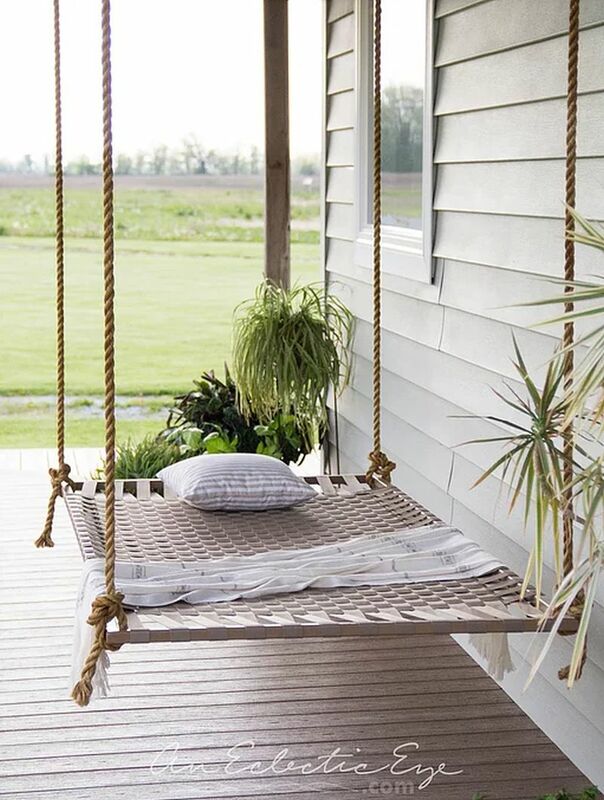 It is a kind of swing bed that’s perfect to be showcased on a front porch. Though it is small in size, it makes a comfy spot to rest. Making one isn’t tough; the only difficult thing here is craft the frame that can accommodate a crib mattress. Check the tutorial at Wild Ruffle. 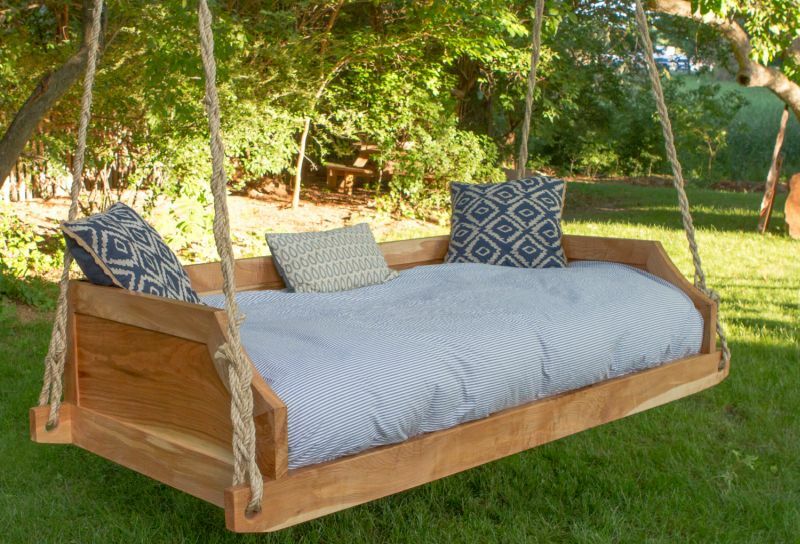 It is a generously-sized swing bed made from wood and decked with a twin-sized mattress. Three lengths of sisal ropes braided together suspend it in mid-air. It has enough space to take a quick nap or provide sitting space for two. It follows a classic rustic theme that adds cool essence to outdoor space. Want to make one for yourself, check out the full tutorial at Matt Cremona. Have you ever searched for ways to repurpose a bed frame or headboard? 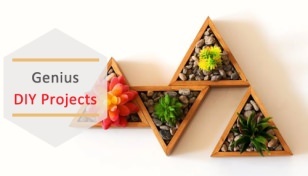 If yes, then this DIY project might be something interesting for you. You can try making one by following the complete tutorial on The Rustic Pig. 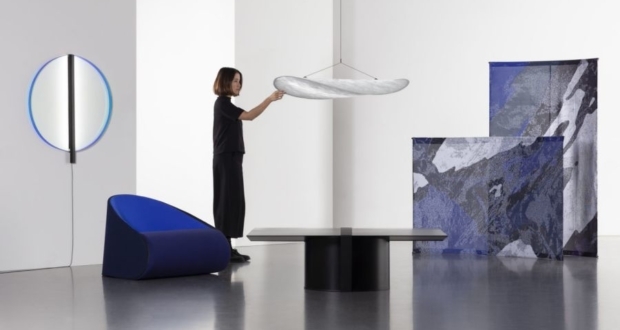 Turning old trampolines into swing beds is a novel idea that’s become a trend on social media platforms. It is a pretty simple project you can make using a trampoline ring, mattress and a few other commonly used things. Here’s a step-by-step guide for help. If you don’t like the classic bench-like design of a porch swing, you can opt for a minimalist flat porch swing. 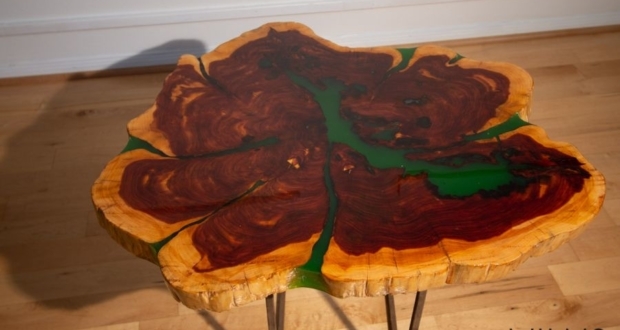 A sturdy piece of plywood seems perfect for this DIY project. You just need to paint it in the desired color and make modifications to hang it with ropes. 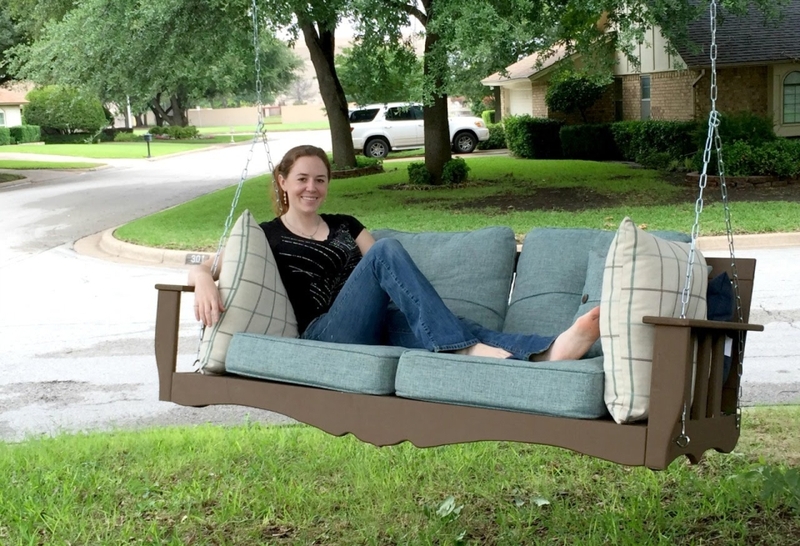 Actually created as a hammock, it appears more like a porch swing. 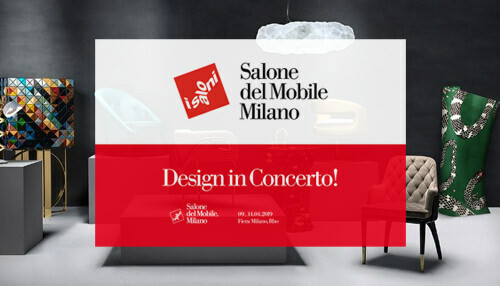 This woven swing bed is made from a rectangular metal frame on which polypropylene webbing is woven to create a seat. 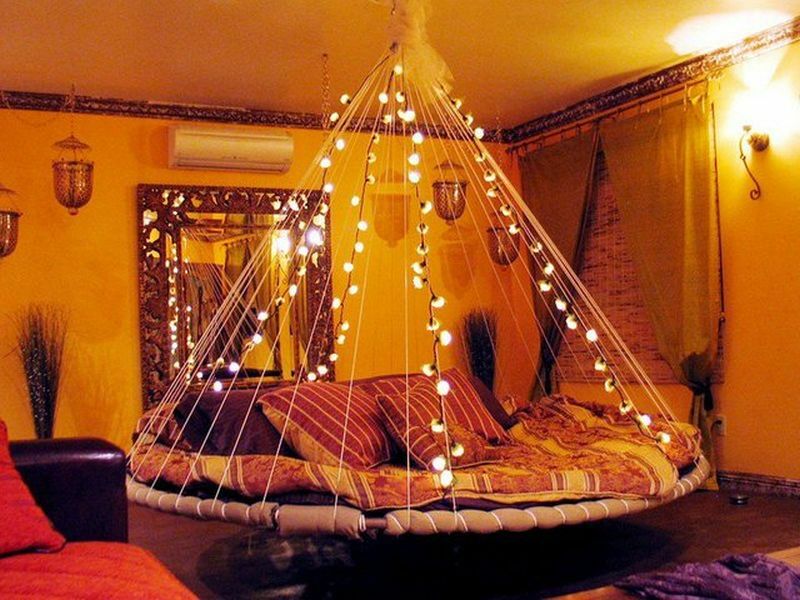 Like any swing bed, it is hung through ropes. Find more at An Eclectic Eye.